Three years ago, widespread protests took place across Europe against a planned trade deal between the EU and the US. It was eventually halted. In order to avoid President Trump slapping tariffs on imports of EU-made cars, EU governments are now planning to agree terms to start negotiating a new transatlantic trade deal. EU and national decision makers have stated that the EU will only negotiate trade deals with countries signed up to the Paris Agreement. Trump has declared that he will take the USA out of it. Thousands of citizens – especially school children – are currently marching in the streets demanding immediate action from decision makers on climate change. European decision makers need to listen to the citizens they serve, and show the world that the EU takes the Paris Agreement seriously. There should be no negotiations with countries that show neither ambition nor action on climate change and environmental protection. Global commitments towards stopping climate change must come before the interests of the EU car lobby. 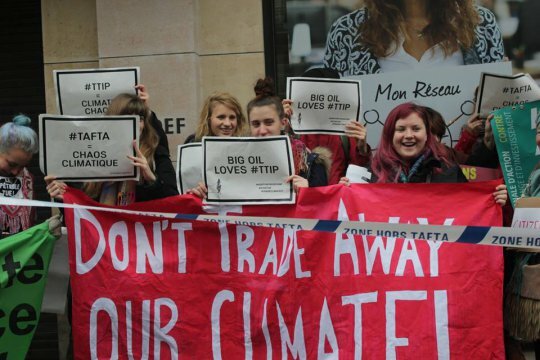 Hard-won standards that protect people and the planet should come before trade deals. As a minimum, EU decision makers must keep their word, uphold the Paris Agreement and not mandate new trade negotiations with the USA. But the situation is urgent, and they must go further. As civil society groups, we call on the European Commission, national governments and EU parliamentarians to use every political and financial tool at their disposal to speedily and justly end the fossil fuel age now. We must avoid the chaos, droughts and rising tides of 1.5 degrees or more of global warming, and bring about a safer, fairer, and cleaner Europe. Germany), Netzwerk Gerechter Welthandel, PowerShift e.V.